Sandra Dolak has recently been selected as one of only 200 National Grant Reviewers in the United States. She has been involved in writing health related grants for a number of years. Dolak was named Huerfano County Citizen of the Year in 2007. Sandy also currently owns North by Southwest gift shop on Main Street here in La Veta. Congratulations Sandy and thank you for all your work and contributions. Two great Community Meetings yesterday to discuss the newly formed Foundation and plans for the Metropolitan Districy. Both the Cuchara and the La Veta meeting halls were filled to near capacity turnouts. Bruce Cantrell introduced the organizing leadership and provided an in-depth overview and explanation of the Plan. We will see the beginning steps of progress as early as next summer. Another beautiful day shaping up this morning here in the Cuchara Valley. Yesterday morning was nice for my La Veta Inn tour. It went well, and another prospective buyer even called to check my progress too (good morning Steve). Ha I’ve gotta remember that about 200 friends, neighbors and clients look at this little daily post so I better not give away any confidences. Weather: A nice rain shower last night cooled things down again. Today we have to head up to Denver but returning this evening. Don’t forget the Cuchara Mountain Resort Updates this Thursday. Principals are to be on hand for community meetings up in Cuchara at Community Rec. Center, 10:00 am and down in La Veta at Community Center, 4:30 pm Aug. 26. Come listen, learn and hopefully feel able to support their efforts. Yesterday was one of the very nicest nicest days we have enjoyed all summer. More people, more energy and more fun since July 4. Weather was fabulous for a change, for the record turn-out of the Stonewall Ride. Years past they have endured a few cold rainey rides, but not this time. A cool partly-cloudy day reaching into the 80s. Heading off this morning to show the La Veta Inn. I confirmed with Bob up in Cuchara that the new Recreation Resort Plan is to be presented at 2 community meetings set for next week, on Thursday , Aug. 26. Planning on presentations up at Cuchara Community Center at 10:00 AM and then again down at La Veta Community Center at 4:30 that same afternoon. see http://www.cucharavalley.org/Hope for more Cuchara post. Hope to see you here next week. Gotta run now. It’s still early, but need to get into town to wish a big send-off to the 8th Annual Stonewall Century Ride leaving La Veta in about 20 minutes. Looks like a wonderful day for the bike ride. 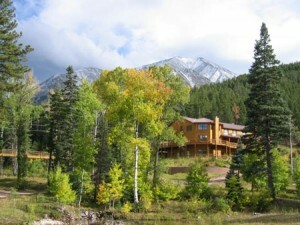 Then I take clients up to Echo Canyon Guest Ranch later this morning. It’s gonna be a GREAT DAY here in the Cuchara Valley. The 600 jobs and and hotel/conference center has been in plans of previous developer prospects also. Some feel this part could be either an exaggeration or long-term dream forecast. But who knows? Clearly the votes approving of the Metropolitan District and subsequent sale of Bonds will be integral to the Plan. And the word on the street is that both of those stipulated requirements are felt to be in well received progress already. hmmm We also hear that the Principals will be speaking at a community forum later this month to present their plan in person and to answer questions. Won’t want to miss that one. As confirmed today by The Signature, the locals involved in the restructure and redevelopment of the Cuchara Mountain Resort include notable locals Bruce & Joan Cantrell, the Lindsay Case Family Company and Dwight Harrison. This looks like a great team of committed and experienced players to me. The Plan is unfolding this week and we continue to look forward to more details. But it is indeed a BIG PLAN and could eventually have huge economic impact on our tourism, jobs and recreation. This Plan is a committment to really start something. It is likely that no money has changed hands yet and probably no deeds recorded yet either. But Agreements and Contracts appear to be in place for the Plan to take life and move forward. It will take vision, effort, bonds, grants, permits and approvals. But with these leaders, lots of effort and a little luck, it could in fact become a reality. We will get you a link to a more detailed story just as soon as we capture one. And later offer our comments on how we see its effect on local real estate demand and prices. WOW, certainly looks like more truth than spoof to the newest news from the Cuchara mountain resort. (see earlier link posted below) This is looking pretty exciting. A new agreement with recent owner Balloun appears to be opening the doors to move forward. Reliable sources have identified the three principals ( they are well known locals to us) and they would have the knowledge, experience and capital securing ability to implement an overall development Plan to create an activity based – all season recreational resort facility on the mountain. The Huerfano County Commissioners have informally even given it their initial support. It won’t all happen immediately (may also still be Deeds to clear up I’m guessing). And various feasibility studies, permits and planning are required. Then there is a rather significant matter of raising the necessary capital to get it all off the ground. But hey, this is the closest we’ve been and most exciting news in a long time for the overall economic health, recreational opportunities and job creation for the Cuchara Mountain Resort. Rumors will be plenty, (and opposition will arise) but tune in again later for more updates (or retractions).